Bring a refreshing and simplistic presence into your living space with the Bay Cliff Chairside Table. Crafted from hardwood solid and Primavera veneers, it features a light Cove Driftwood finish on woodwork. A fixed bottom shelf offers convenient space for accents and decor, and above, a single drawer provides room for tucking away small living items and accessories. 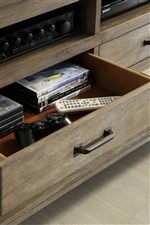 The drawer is decorated with a simple hardware bar pull, and matching hardware accents decorate each table leg. The Bay Cliff 1 Drawer Chairside Table with Bottom Shelf by Riverside Furniture at AHFA in the area. Product availability may vary. Contact us for the most current availability on this product.